The World Bank acknowledges: 'India's economic and human development is one of the most significant global achievements of recent times.' India's share of global GDP escalated from 1.8 to 2.7 per cent between 2005 and 2010. More than 53 million people have been lifted out of poverty here in India in that time — and that's more than twice the entire population of Australia. Between 2003 and 2013, the Indian economy expanded at an average rate of 7.6 per cent, making India one of the ten fastest growing nations. India's quest to provide electricity for even more citizens requires an assessment of policies which result in the wholesale displacement of villagers whose traditional lands are taken over for the development of coal mines and adjacent power plants. India's quest for cheap coal to generate electricity is subject to understandable scrutiny in Australia with the proposed development of the Adani Carmichael Coal Mine. Some think environmental lawyers and environmentalists take a too restricted view of the complexity of the competing goods to be achieved. "I doubt Pope Francis would be a supporter of the proposed Adani mine which will be Australia's (and perhaps the world's) largest coal mine. He thinks any scheme for buying and selling carbon credits is flawed." The major political parties in Australia now support the development of the Adani mine, satisfied that the local indigenous land claimants have concluded an indigenous land use agreement (ILUA) and convinced that the expedited approval processes will take sufficient account of environmental concerns. The Australian government has even argued that it would be immoral to block the mine because Australian coal is cleaner than any other coal available to Indian power generating corporations. Having visited some of the coal mining which is impacting on local villages in Jharkhand, I am left wondering if it might be better to mine coal in Australia with agreement from Indigenous owners rather than in India with tribal villagers being displaced. These are difficult moral quandaries for business people and not just lawyers or politicians. This provides the real challenge for decision makers in India committed to sustainable development accelerating the alleviation of poverty for tens of millions of people who have never known the basics of good health, education and housing. Francis speaks of the need first to 'reject a magical conception of the market' and then to redefine 'our notion of progress'. He proceeds to utter the unthinkable, that 'the time has come to accept decreased growth in some parts of the world, in order to provide resources for other places to experience healthy growth'. Stern, like many international opinion leaders in this field, has learnt lessons in between Copenhagen 2009 and Paris 2015. He now sees that 'looking for formal international sanctions within an agreement that have real "bite" may be a mistake'. He sees a greater need for 'routes and processes that can encourage both collaboration and ambition'. There is no substitute for building trust, enhancing the 'mutually supportive relationships between overall agreements at the international level and actions at the national, regional, city or firm level'. Neither India nor Australia can go it alone when confronting a global issue such as climate change. And given the scale of investment, innovation, and technological development required for sustainable development, governments cannot do it without business being aboard, convinced and committed to real change. India cannot disregard the effects on other nations when it adopts laws and policies for alleviating the poverty of the poorest of the poor. Australia cannot disregard the effects on other nations when it considers restricting the availability of resources for export such as coal which might help provide electricity for the world's poorest citizens. Frank Brennan SJ is professor of law at Australian Catholic University. 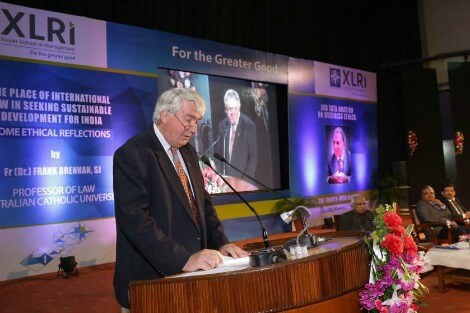 This is an extract from the 45th Annual Tata Oration delivered by Frank Brennan at XLRI, Jamshedpur. Please listen here. Both you and the Pope are able to empathise with the Indian poor who are poor well beyond the imagination of most Australians. India is, in many ways, in a similar situation to that Britain was at the beginning of the Industrial Revolution, which caused massive social dislocation with people moving from rural areas to the towns. This dislocation eventually resulted in prosperity for more people than the old agricultural society did. I appreciate the fact you are not a moral prig and can see both sides to the coal power generation issue in India. Many self-styled conservationists in this country cannot do so. They cannot empathise with the average Indian but project their own morally bankrupt Puritan 'thou shalt not have' vision onto the situation there. To me this is a racist neo-colonial vision. India cannot immediately jump to all renewable power generation. There has to be an intermediate stage. I think also we in Australia need to realise that nuclear power generation will play a part during this intermediate stage. Better nuclear than coal? Possibly but we need to be careful here: the construction of some of the nuclear power plants in India have had really bad effects on local communities. I hope that discussion about "alleviating the poverty of the poorest of the poor" versus human induced climate change can be wider in scope than just pitting it against the interests of fossil fuel investors. My impression of the risks posed by climate change to all of humanity - and especially the poorest - is that the risks are very bad indeed. Perhaps I have more confidence that sustainable energy solutions and Australian generosity have a much bigger role to play than Frank seems to think in this article. To emancipate the poor in India, the caste system would have to go. That is not going to happen. The high caste will never share with the untouchables (the poor) and in the end will govern only for their own. I am sorry Frank, but I am not clear whether you are suggesting or not that Australia should support the Adani mine in order to alleviate poverty in India. Where is the evidence that 'the local indigenous land claimants have concluded an indigenous land use agreement (ILUA)' ? I get a very different impression from statements by people purporting to be aboriginal leaders in the area that I read in publications by GetUp. They have campaigned internationally and persuaded major banks not to lend to Adani. Who is telling the truth? They or the major political parties? I know which I would put my money on. Better to emphasize a proper redistribution of wealth through very progressive taxation and the disgusting extreme differences between wealthy and poor than to sacrifice the environment. I seriously question, too, whether the local indigenous landowners are in favour of this. Thank you Frank for posing the conflict between global pollution, through unfettered burning of coal, and global relief of poverty. There is however a crucial missing variable in your logic and that is population. There is persuasive evidence from other countries that until the births per fertile female falls below three poverty will persist. Given that a proportion of Indians have been "lifted out of poverty" it appears that there is also a "sub-nation" of 300 million that has not so benefited. I believe that these are likely burdened by an inability to do better because of family size and lack of support for family planning. For all his deeply-felt compassion for the poor Pope Francis has yet to utter the "P" word! China is a classic example of population braking and prosperity following. I do not endorse in any way the draconian methods applied in China to achieve what has been done but the effect on national GDP is obvious as tens of millions of men and women are relieved of the burden of a large family keeping them away from skills training and the freedom to find jobs. Catholics must support the need for women to control their fertility. I think John Frawley is unduly pessimistic about the caste system in Modern India. Industrialisation and the modern economy have changed the power balance to a considerable extent in the cities. The present Prime Minister, Narendra Modi, was described by one journalist as being by origin 'a low caste oil presser'. It would have been inconceivable a while ago for him to have headed either the BJP or the nation. Politics are no longer controlled by the higher castes. Hinduism, like all religions, is somewhat more fluid in practice than theory. Could you say more about the Pope positing the unthinkable, that 'the time has come to accept decreased growth in some parts of the world, in order to provide resources for other places to experience healthy growth' as it is confronting because it may mean increased poverty in societies geared toward aspiration and personal responsibility for non-achievement as it challenges the modern myth of unlimited material progress for all being possible under capitalism with many jobs going offshore through outsourcing and relocating of industries leaving new inhabitors of the margins in previously prosperous economies. Would progress then be conceived as a more balanced access to basics as it is obvious the continued exclusion of millions in India to basics is untenable…Do we need to recognise we are citizens of the world residing in Australia?